A fun night out for bachelorette parties is to go to an interactive play. Check a show schedule near you. The best musicals are the smaller interactive ones that you can participate in. You are sure to have a fun time by going to a bachelorette party musical near you or where you are staying for the last night out. Call for group discounts and have a ball! Everyone loves a great concert of your favorite band, group or cast. Choose the bachelorette's favorite band or act and get tickets for the last night out! Have some dinner and drinks first and then see an awesome concert. You may even have time to go out after. 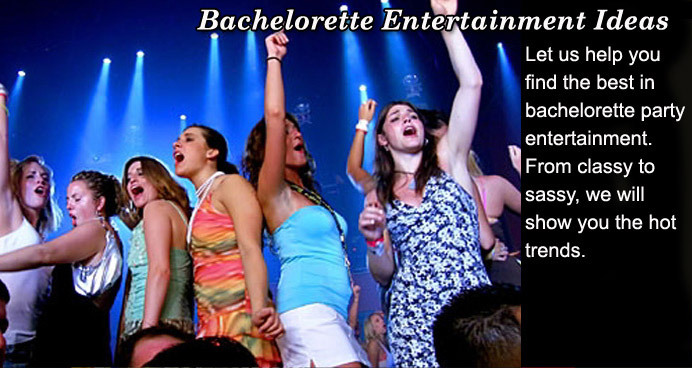 Bachelorette parties are finding a concert a great alternative night, especially if you grab a party buss or bachelorette party limousine for the festivities. There is nothing like a lot of laughter at your bachelorette parties. We suggest going to a comedy club near you or where you are staying. Get an hour or two of laughing and some appetizers and drinks before going out on the town. You will be revved up with some great comedians! Get some recommendations to the best places and call for group discounts. A great way to spend a few hours at bachelorette parties! Nothing is like partying on surf and sand. Go to the nearest beach, lake or watering hole and have a great time. There is usually nightlife wherever there are waves. From San Diego to the Jersey Shores, you are sure to have a great time at local bars, hangouts and dives in the finest bachelorette party venues. Call around and ask for the best places near you. Check out some sites like Esquire and The World Best Bars section to find one near you. Nothing says partying like Mickey and Minnie. Go to Disneyland or Disneyworld for your bachelorette parties and have some great clean fun. Spend the say and evening there. When the park closes, go to a local bar. If you stay near the park, you will be in walking distance to some fine bars like House of Blues and many others that cater to bachelorette parties! A fun and memorable time with the girls. By the way, there is alcohol at the park but just don't get too drunk since there are kids running around. Whether you are into camping, hiking, rock climbing, going to the lake, or just want to be outdoors; pack up a motor home, SUV or van and go stay with nature. River rafting and camping out under the stars are a great time. Light a camp fire and tell funny stories about the bachelorette. It will bring all the girls much closer and is much fun for those who like to be one with nature. Make sure you have the bride to be and a majority of the girls wanting to do this since this is not the typical bachelorette party festivities!